You have added Dusky Peach Front-Slit Anarkali Suit with Layered Look and Floral Embroidery in Net to your Shopping Bag! Be an ethnic diva at the next party or wedding ceremony you attend! 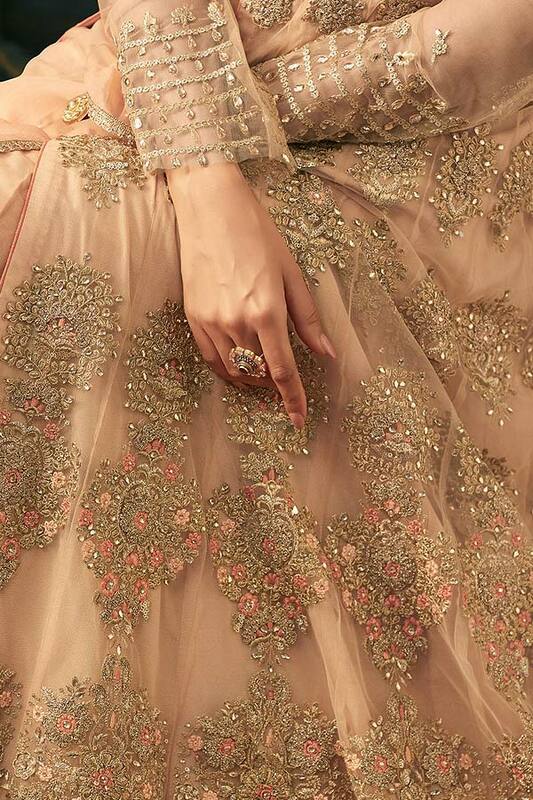 This dusky peach embroidered anarkali suit with front-slit and layered look in net looks stunning. It is accentuated with floral embroidery in zari and thread and is embellished with stones and sequins. Striped border at the hem lends a layered look. The look gets complete with ombre peach dupatta (shaded) with sleek golden lace border and stone work. It comes with an unstitched matching shantoon bottom. Dusky Pink Floral Embroidered Anarkali Suit with Layered.. Beige Floral Embroidered Anarkali Suit with Layered Look in..